NETWORK FINALS: The SUPER BOWL adjusted to 33.4, down 3.7 from 2017, while THIS IS US ended up at 9.3, up 3.2 from last year’s 24: LEGACY. 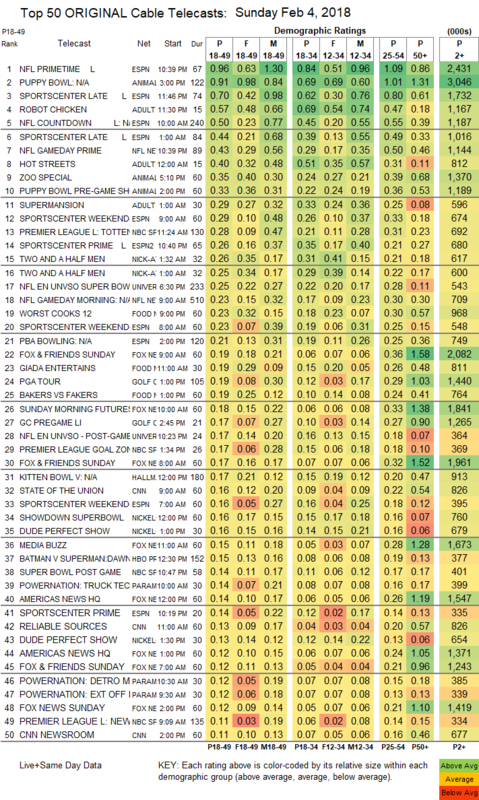 For those who care, the BOB’S BURGERS rerun gained 0.1 in final numbers. CABLE HIGHLIGHTS: It was slim pickings for cable on Super Bowl Sunday. In fact, the highest rated show of the night was ESPN’s post-game NFL PRIMETIME show at 0.96. 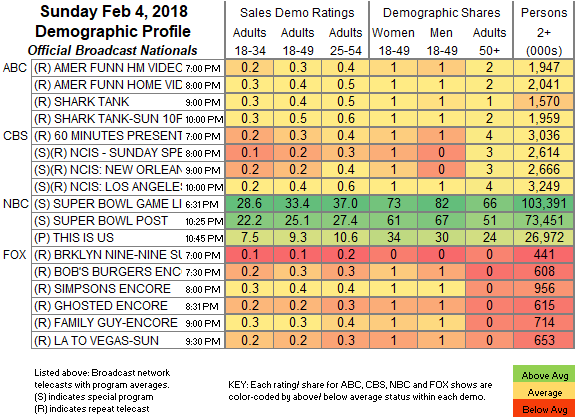 Animal Planet’s PUPPY BOWL rose 0.12 from 2017 to 0.91 after a PRE-GAME SHOW that ticked up to 0.33, and with lead-out ZOO SPECIAL at 0.35. NBC Sports Net’s PREMIER LEAGUE soccer match was at 0.28. Univision’s Spanish-language SUPER BOWL telecast was at 0.25. Food Network’s WORST COOKS IN AMERICA slumped by 0.33 to 0.21. Hallmark’s KITTEN BOWL was up 0.03 from last year to 0.17. Adult Swim, airing long after the game, dominated scripted programming with ROBOT CHICKEN down 0.05 to 0.57, HOT STREETS at 0.40 compared to last week’s 0.33/0.31, and SUPERMANSION up 0.04 to 0.29. All things considered, Starz’s COUNTERPART held up pretty well against the mega-competition, down 0.03 to 0.08. On HBO, though, CRASHING lived up to its title with a 0.07 drop to 0.05, and DIVORCE fell 0.06 to 0.05.